Benjamin Britten; Christmas Traditional; Christopher Steel; Harold Darke; Henry Walford Davies; Herbert Sumsion;... Very Good. In very good packaging. 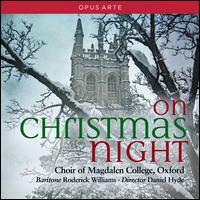 Choir of Magdalen College Oxford-On Christmas Night [Roderick Williams; Choir of Magdalen College by Choir of Magdalen College Oxford.